parting shot "Parting Shot'' is a monthly opinion column written on a rotating basis by guest authors. The opinions expressed are not necessarily those of FE&S. 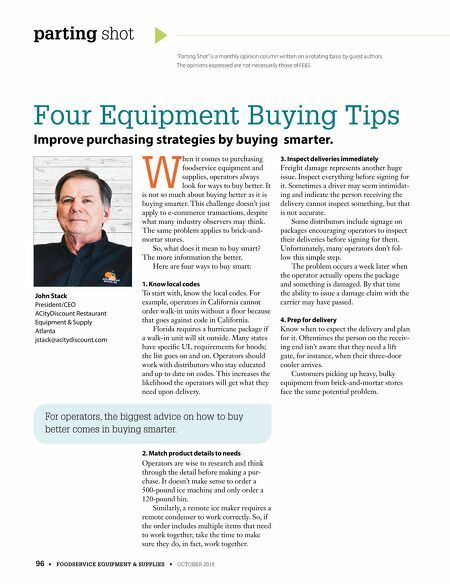 Four Equipment Buying Tips Improve purchasing strategies by buying smarter. John Stack President/CEO ACityDiscount Restaurant Equipment & Supply Atlanta jstack@acitydiscount.com W hen it comes to purchasing foodservice equipment and supplies, operators always look for ways to buy better. It is not so much about buying better as it is buying smarter. This challenge doesn't just apply to e-commerce transactions, despite what many industry observers may think. The same problem applies to brick-and- mortar stores. So, what does it mean to buy smart? The more information the better. Here are four ways to buy smart: 1. Know local codes To start with, know the local codes. For example, operators in California cannot order walk-in units without a floor because that goes against code in California. Florida requires a hurricane package if a walk-in unit will sit outside. Many states have specific UL requirements for hoods; the list goes on and on. Operators should work with distributors who stay educated and up to date on codes. This increases the likelihood the operators will get what they need upon delivery. 2. Match product details to needs Operators are wise to research and think through the detail before making a pur- chase. It doesn't make sense to order a 500-pound ice machine and only order a 120-pound bin. Similarly, a remote ice maker requires a remote condenser to work correctly. So, if the order includes multiple items that need to work together, take the time to make sure they do, in fact, work together. 3. Inspect deliveries immediately Freight damage represents another huge issue. Inspect everything before signing for it. Sometimes a driver may seem intimidat- ing and indicate the person receiving the delivery cannot inspect something, but that is not accurate. Some distributors include signage on packages encouraging operators to inspect their deliveries before signing for them. Unfortunately, many operators don't fol- low this simple step. The problem occurs a week later when the operator actually opens the package and something is damaged. By that time the ability to issue a damage claim with the carrier may have passed. 4. Prep for delivery Know when to expect the delivery and plan for it. Oftentimes the person on the receiv- ing end isn't aware that they need a lift gate, for instance, when their three-door cooler arrives. Customers picking up heavy, bulky equipment from brick-and-mortar stores face the same potential problem. 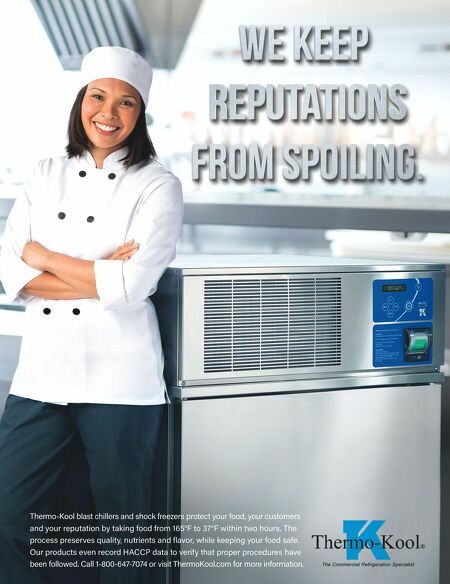 96 • FOODSERVICE EQUIPMENT & SUPPLIES • OCTOBER 2018 For operators, the biggest advice on how to buy better comes in buying smarter.